One thing I haven’t done a terribly good job of is covering the various Parker pastiches, homages, tributes, and rip-offs. (I’ll try to do better, I swear!) Fortunately, in the case of Max Allan Collins’ Nolan novels, someone has stepped up to the plate to provide the coverage that I haven’t. That person is Mr. Dan Luft. Please give him a warm welcome. He will examine the complete run in a series of three guest posts. 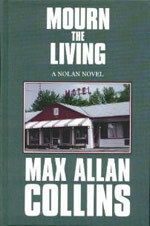 The Nolan novels by Max Allan Collins have been notoriously connected to Richard Stark’s Parker since they were first published forty years ago. Collins has always been quick to state that his original homage turned into some sort of a ripoff once Nolan also became a series character like Parker. But this might have been a form of veiled self promotion for a young, unknown writer. Like Stark’s Parker, Collins’ Nolan is a thief who specializes in complex crimes involving other freelance criminals who exhibit varying degrees of professionalism. But in Stark’s books, the action is described by a cold, third person narrator who never tells anything more than Parker’s physical actions. With Collins’ series the narrative is often in Nolan’s head, which softens him as a hard-nosed criminal, and recurring characters in the series make for a different tone than the Parker books ever had. The first book in Collins’s series, Bait Money, owes its plot and pace to many crime writers of the ’50s and ’60s. It begins with Nolan stuck in a room recuperating from a bullet wound in his side. This could be a nod to Dan J. Marlowe’s The Name of the Game is Death, which Collins had certainly read growing up. The next big scene has Nolan walking alone in the rain sizing up a hired thug that might just be tougher than he is. The ponderous scene plays quite a bit like the opening chapter to Peter Rabe’s The Out is Death. Collins isn’t using just Stark for inspiration, he’s using the generation of crime writers he grew up reading. Nolan is an older criminal, pushing fifty and trying to live a straight life. He’s spent years hiding from the mob after killing a “made” man but, before the book begins, was spotted by gangsters (hence the bullet wound) and has lost all ability to reconnect to the money and name that was tied to his respectable life. So he has to start over from scratch and find money again. But, since he is at odds with the mob, he is now reduced to working with amateurs, college kids who want to play criminal and rob a bank. These amateurs include comic book-loving Jon, the nephew of Nolan’s last connected friend, and Jon’s friends, the stoner Grossman and Grossman’s girlfriend Shelly. When Nolan meets Jon, his initial contact for the robbery, it is packed with Jon’s discomfort but instant respect for the older guy. There are obviously a few ways to read the scene. It could be a reflection of the comic book reading Collins bumping up against some high-powered faculty at the Iowa Writers Workshop where Collins wrote this book. It could be the emotion Collins felt as he corresponded with established authors Donald Westlake and Mickey Spillane. Or it could be his then-current self meeting up with the hardened, middle-aged writer he hoped to become. Any way you read it both Jon and Nolan probably agree that Jon is likable but naive and nerdy. The style of writing makes for a pretty slow pace. This is both a first novel and part of an MFA thesis. Every word is worried over and tinkered with. Car doors “snap” open, clothing is described in great detail as is furniture. Many conversations begin with a number of pleasantries. Everyone is constantly fiddling with cigarettes and offering them to each other. There’s coffee in hands or there’s beer in hands. There aren’t many characters in the book but they all get descriptions and backstories as detailed as most main characters ever get in a book of this length. Everything but the clouds in the sky is described at length. Most of the first book is from Nolan’s point of view as a bank robbery is planned. There are endless descriptions of country roads and interstate highways for escape routes. Then, more than halfway through, possibly as a nod to Stark, we get Grossman’s story when he meets up with Nolan. Then the story shifts around a bit more and we get a bit of Jon’s point of view too. With all these points of view after starting out with just one, the narrative becomes less focused but moves along faster than before. Nolan is supposed to be very good working with a team of professionals on high tech heists. But the heist in this book is very low tech, simply involving haircuts for the kids and decent suits to pose as bank auditors. The heist is pretty tame. The tension comes from the expected loose cannon in the gang. The main characters of Jon and Nolan don’t have to commit any nasty violent acts and so remain entirely sympathetic. Nolan is hardboiled by reputation, not by anything he does here. One problem with Bait Money is fixing a time period for the action. The book was originally written in the early ’70s and was published by Curtis paperbacks in 1973. Then it was revised by Collins and reprinted by Pinnacle Books in 1981. Since the book had been largely forgotten and was being printed for a new audience, Collins clumsily moved the action to the 1980s. But large swaths of the book practically scream the early 1970s. Grossman is a college dropout who has lost his anarchic politics and now simply wants to score some money, move to Canada with his lady, buy some land and smoke some grass. During Nixon’s first term with the draft and the Vietnam War in full swing, this was a dream for a lot of kids in their 20s. For the book to take place in 1981 makes Grossman’s politics look positively quaint and outdated. He would’ve been the last hippie on the bus with that dream. The reader might think the book still takes place in 1973 except for a few pop cultural references. The descriptions of a t-shirt for the 10th anniversary of Woodstock and a girl who looks like Bo Derek stick out as badly as CGI on the retooled Star Wars. Luckily, most of this book reads like it is still from the 70s; the edits are few or better concealed than the ones mentioned. So Bait Money doesn’t hold its own against the Richard Stark novels that inspired it. 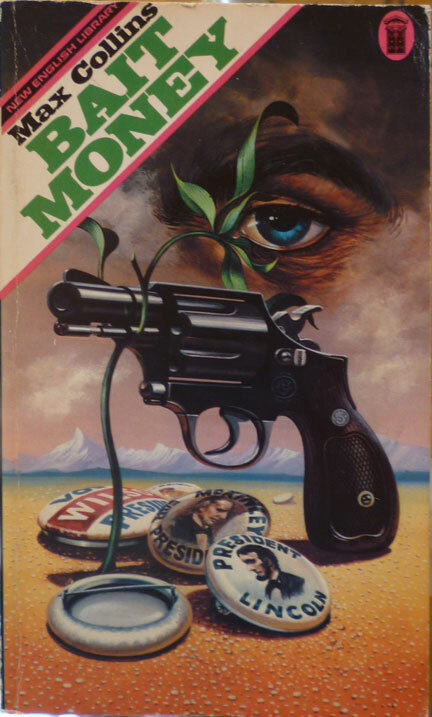 But does it hold it’s own against the first novels of Peter Rabe, Dan Marlowe, or Alan Marshall (Westlake’s first pseudonym) or even against Westlake’s first novel under his own name, The Mercenaries? Yes, it does. The Hunter was Westlake’ 20th novel, he knew how to write by then. Collins was still learning his craft and the series steadily improves book-by-book. What must the editor at Curtis books have thought when the manuscript for Blood Money thumped onto the desk? When you ask a young writer for a sequel to his first published novel, you just hope that it shows up on time and the story makes sense. But Blood Money is the work of a very confident, almost cocky, kid. Where the first novel takes place over several weeks, Blood Money takes place in a little more than a day. The first two thirds of the book take place in a couple hours and the time only extends in the last third due to Nolan driving hundreds of miles. Nolan is not the focus of this book, structure is the focus. Collins has enough points of view here to make John O’Hara’s head spin. He mostly pulls it off but there are still a few problems. The beginning, with two men wearing Hawaiian shirts, eating ice cream and drawing their guns before stealing Nolan’s money, is awkwardly silly, not intentionally humorous. The recap of the previous novel is laborious as we read Nolan’s and Jon’s thoughts on the action. We get to spend too much time in the characters heads as they think very similar thoughts. And Jon’s thoughts of Nolan run deeply toward co-dependence. But the shifts in viewpoint are successful. The story moves forward and the reader can sail through a very bad day after Jon and Nolan lose the money they stole in the first book. The book also has a feel of the early ’70s but the ’80s references don’t intrude on the story as much as they did in the previous book. Both Bait Money and Blood Money are available in a single volume from Hard Case Crime under the title Two for the Money. This printing uses the 1980s version of the stories. Mourn the Living is a bit of a one-off. Collins wrote it around 1968 as an undergrad when he was about 20. He had sent it to publishers who rejected it or asked for rewrites that he didn’t want to do. So he began Bait Money and relegated Mourn to be a trunk novel. It was eventually serialized in the magazine Hardboiled thirty years after it was written and saw book form in the tiny Five-Star Press ten years ago which mostly sells hardcovers to libraries. The current run by Perfect Crime Books is by far the most commercial printing it has had. The book is about how Nolan, at the behest of one of his last friends in the mob, sneaks into Chelsey University to find out what happened to the mobster’s daughter who has died. The story reads like a private eye novel but with a Get Carter criminal feel to it. What is most interesting about the book is its cynical attitude toward the counter-culture and the myth of the hippie even as it was being formed. Nolan, the middle-aged thief and killer, takes a dim view of the lethargic drop-out attitudes of the counter-culture. Nolan can’t stand the lack of work ethic the kids have. 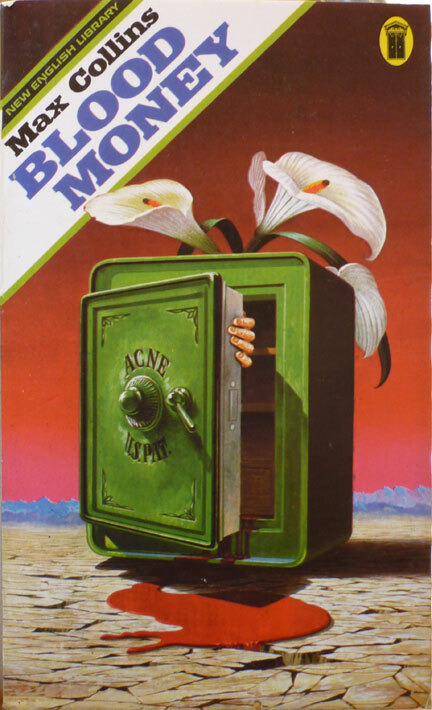 Surprisingly, Bait Money, with Grossman’s early-70s-post-flower-power attitudes, becomes a more interesting book in light of its lost predecessor. Between the Cuban Missile Crisis and Watergate, hardboiled crime fiction was in a period of decline as international spy fiction was on the rise. The more popular crime novelists of the 60s tended not to criticize American culture the way their predecessors had done since the 1920s. Crime fiction often became more mannered and plot oriented during the decade. Collins dipped into contemporary politics in both Mourn and Bait Money in ways that few writers were doing at the time. But then the Nolan series hit a huge snag when Curtis was bought by Popular Library which then decided not to print the remaining books that were already written and not to return the rights to Collins for a long time. When the series re-booted in the early 1980s, with Pinnacle, that publisher had a threatened lawsuit by powerhouse author Don Pendleton for some perceived copyright infringement. (Don Pendleton’s widow insists that Collins is misremembering the past and that Pendleton had no contact with Pinnacle at that time.) Collins backed off from social critiques in his books until he began to write historical novels in the ’80s. And since then historical novels have been a large chunk of his output. It is possible that, given the two publishing debacles of the Nolan novels, the author might have felt it wise to turn away from anything politically controversial or timely and first take care to get his books published. If this is true then it is another possible lesson learned from writers like Peter Rabe, Dan Marlowe, and Richard Stark. Mr. Dan Luft will return to cover the other five books in Max Allan Collins’ Nolan series. I am quite psyched. The first part of my long-ish article about Max Allan Collins and his NOLAN series is up on th great site The Violent World of Parker. This is flattering, and I’m sure the criticisms are apt, but I’m not going back to check. To this day I am accused of over-describing, and that has to do with (a) my desire to control the reader’s experience, and (b) characterizing through clothing and surroundings. Just a couple of things. I have never read Peter Rabe. The only Gold Medal author I read as a kid with any regularity was Richard S. Prather. I read a little Dan Marlowe but was not a huge fan. My heroes were, and are, Spillane, Hammett, Chandler, Cain, Jim Thompson, Horace McCoy and W.R. Burnett. But the Nolan books were at least as heavily influenced by the Sand novels of Ennis Willie as by the Parkers. The major influence of the Parkers was not Nolan himself (he was, again, as much Sand as Parker), but by Westlake’s point of view, the way he limits information to what the POV character sees and experiences, and the fun he has with reporting the same action from two different points of view in separate chapters. Also, I wrote plenty of contemporary novels even during the years when I began doing historical fiction, and often delved into political subjects. My comic book Ms. Tree specialized in topical crimes (like abortion and gay bashing). Both the Mallory and especially the Quarry series were both contemporary and political, particularly where Vietnam is concerned. My novel MIDNIGHT HAUL was an early eco-thriller. And so on. What I think is most significant about the Nolan series is that I was writing about the counter-culture before anybody else in mystery fiction, at least that I know of. Certainly nobody had a comic-book geek/nerd as a co-star in any mystery series. It was “meta,” if I understand the term, which I probably don’t. And don’t assume, just because Nolan is the main POV character, that I agree with him, as in his views of the hippie era. I write about Mike Hammer but I voted for Obama. Thank you for this attention. But nothing is weirder than reading what someone has to say about something you wrote forty years ago. Oh, and I have no memory of doing any ’80s updating, though I apparently did. If so, it would have been minimal and at the insistence of Pinnacle, who must have wanted a clean start. The only revising I remember doing was in FLY PAPER, which had to do with skyjacking — airport security had gone in since I originally wrote the novel, and I had to deal with that. It was an odd feeling sitting home writing this article knowing full well that Max Allan Collins was going to see it eventually. Perhaps any theories about the influences and intentions of a living writer are just B.S. and should be kept a secret until the author can’t tell me how wrong I was. Comparing Bait Money to Dan J. Marlowe or Peter Rabe was just trying to find a context for the book within the evolution of the crime novel. I am a little shocked that you haven’t read Peter Rabe but then no one says you had to. The Nolan series was a big leap in my personal enjoyment of crime fiction. They were the first crime books I read that we’re not detective fiction and were my pathway to writers like Westlake, Marlowe and even Charles Williams. Max Allan Collins, though you may find it weird to see an article about books you wrote a long time ago, you were the one who took the initiative to bring them back into print. For that I am thankful because they are worth a good read now as they were back then. No intention to criticize. Just to clarify and give you answers to questions you raise. Rabe was a huge influence on Westlake/Stark. I own a lot of his stuff but never got to it, for no particular reason. Shockingly, I haven’t read Goodis, either, but plan to rectify that with the new Modern Library collection. In the Gold Medal realm, I read some John D., but not a lot, and a fairly good slug of Charles Williams, who is excellent. Read some Stephen Marlowe and, come to think it, all of the early Matt Helms by Donald Hamilton and Joe Gall by Phillip Atlee. Basically ’60s Gold Medal as opposed to ’50s, because I was reading the stuff in junior high in the very early ’60s. Great work, Dan. MAC has a special place in my heart because one of the very first pieces of crime fiction I consumed at about age twelve was one of his Mallory books. After reading most of his series fiction my favorite MAC character is Quarry, with Nolan a close second. Quarry reminds me of Parker way more than Nolan does. Nolan’s career ended with Spree about twenty-five years ago. But MAC brought my man Quarry back from retirement. I think it’s time he did the same with Nolan. Last time MAC was here was when he commented on Trent’s review of his and Spillane’s The Consummata. A book I liked very much. Morgan The Raider is my favorite Spillane character. Bait Money has little in common with the best of Rabe or Dan J. Marlowe. These guys were outstanding talents (not to say MAC isn’t, either, but I don’t think Bait Money is representative of his best writing). Rabe and Marlowe are sadly underappreciated. Mainly cult writers. I love The Name of the Game is Death so much it’s a joke–it’s one of my very favorite novels. And Rabe is a wildly talented writer. I can definitely see the Rabe influence in DEW’s early writing. Dave, I had read The Out is Death shortly before I reread Bait Money so it was on my mind and what struck me about both books was a sense of quiet brooding. Also, I think Collins, like Rabe, tries to show gangsters as three-dimensional characters who, under different circumstances, might’ve led straight lives. Yeah, Nolan wouldn’t have been a heister if he hadn’t run into trouble with the Chicago Outfit. And maybe Quarry wouldn’t have become a hitman if he didn’t catch his wife schtupping another guy. Although he probably would have killed someone in a barfight or something–he seemed really nihilistic and quick-tempered after coming back from Vietnam.